Unfortunately I think that level of damage with a big dent and buckled top tube will make the bike dangerous to ride. There's a chance that when a big bump or pothole is hit the top tube will fold and dump the rider face first into the road. Additionally, the head tube probably is not aligned with the seat tube anymore, which means the wheels are misaligned which will negatively affect steering. That frame is definitely not safe to ride anymore. While some steel frames can handle dents pretty well, that is some major damage in what seems to me an aluminium frame. 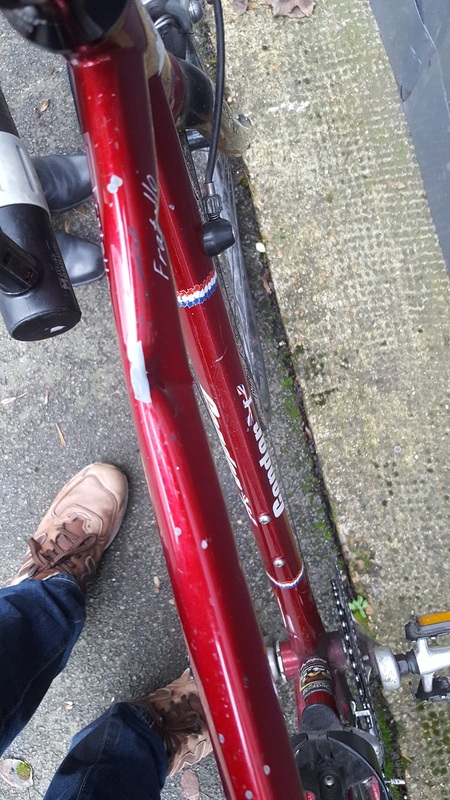 The top tube seems both dented and bent, which likely has affected the steering of the bicycle and also introduces risk of the frame bending inwards under stress. I recommend you don't ride that anymore, start looking for a replacement and see if you can get the person responsible for that to fund it. Sorry for that act of vandalism that happened to you. But I'd refrain from using this bicycle any longer. You'd have problems riding it in a straight line because the wheels are certainly misaligned now which could even cause more uncertain behaviour at speed. The other danger could reside in the sudden failure of the compromised top tube of the frame. The only thing you could do, apart from filing a complaint with the police would be to take the bike apart and re-use or sell all the undamaged parts. That top part of the frame has buckled. As such it has — and I am not exaggerating now — less than one tenth of its design strength. That bike will fold in on itself if you try to use it. Hence, sorry, but that frame is busted for good. Not the answer you're looking for? Browse other questions tagged frames safety or ask your own question. What does this warning symbol on my pannier bag mean? Does a three foot passing law actually require drivers to give three feet?